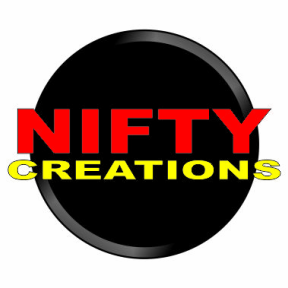 Welcome to Nifty Creations, where all the jewellery, fashion & home accessories are individually designed and created by me in the Nifty Studio, producing unique items to reflect your personal style. I am a Sydney based bead artist, creating unique fashion accessories in many mediums and successfully sell my work through this website, at art shows, and am often commissioned to create specifically for my clients. As a fundamental part of beading in Australia over the last decade, and actively supporting not only online groups, but devoting my time to the beading world as a whole, I look forward to this craft gathering momentum, and to it becoming a craft that gathers a lot more members. As an active member of The Bead Mavens; a collaboration of International bead artists from 2013 - 2014, that share ideas through numerous blog posts, I was able to impart knowledge and insight in to the art of beading and marketing. Recently, I set up the Macarthur Bead Society, as a way for like minded members to come together to share their love of beading, learn, and have fun. I only use the finest beads, gems and metals, including; Swarovski Crystal, Czech Crystal and Glass, handmade Lampwork Beads by local lampwork artists, Natural and unusual Gemstones, Sterling and Fine Silver and Gold. At Nifty Creations I welcome special requests for custom-design jewellery items and fashion accessories for Bride and Bridesmaid jewellery, Formal Occasions, Debutante Balls, School Formals, Anniversaries, items for the Man in your life, and all other occasions and everyday wear. While browsing these pages, if you find something you like and would like to make it yours, its as easy as a click away.. If you find something that has been sold, contact us, and together we can create something new, that is as individual as you.